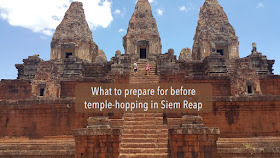 The first thing that you need to know is how long your trip will be in Siem Reap. You can start working around the number of days that will be allotted for spending on tours when you've finally fixed your schedule. 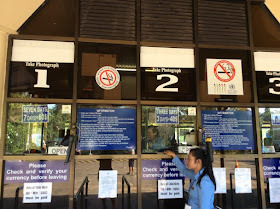 As for us, we availed the 3-day admission pass since we were only staying in Cambodia for 4 days. Photo taken in 2015. Admission park rates have changed since then. Securing an admission pass to the Angkor Archaeological Park is important because this will grant you access to all the temples and sites within the lot. So make sure to carry your permit at all times because this will be checked upon entry, especially when visiting the major temples. Your photo will also be taken and printed on the ticket, which will serve as both your pass and ID. Unless it's from your identical twin, you should forget about borrowing someone else's permit. NOTE: An admission pass, which has three types, are sold at different prices. There is a 1-day pass for US$ 37, a 3-day pass for US$ 67, and a 7-day pass for US$ 72. 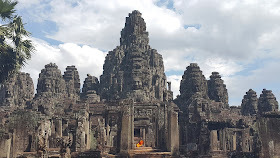 Seeing Siem Reap can be draining, especially if you're traveling to Cambodia during its hottest months (the sun can be super intense during the day). You will be exploring a tropical environment, so it’s best to go out prepared. Consider wearing airy and light clothes (Eg. dry-fit shirts, long breathable pants) that will help protect your skin from the heat of the sun or bites from mosquitoes. Also, make sure to wear appropriate clothes as most temples won't allow entry when you're in revealing attire (Eg. above the knee shorts or skirts, sleeveless tops). Bring a hat or scarf that you can wrap around your head and face (helps when passing through dirt-packed roads). Better yet, bring an umbrella for better coverage (from either sun or rain). Best of all, wear sunscreen (reapply when necessary) and wear sunglasses. Your eyes would need protection from the sun too. May to October is the wet season in Siem Reap. Should you visit during these months, make sure to bring a raincoat, too. Other than sunscreen, you can also put on mosquito repellant before sunrise and sunset. You can apply it on top of your sunblock lotion. Wear comfortable shoes (find a pair with a good grip) because you will be walking and climbing surfaces from temples and ruins that are uneven and rough on the edges. We can get caught up in seeing every site there is to see on any tour, and that's perfectly fine. Surely, you'll want to get your money's worth and time. But when you travel, make sure to savor the moments too. Try to pick a spot and maybe do a sketch of one of the temples that you visit. It doesn't always entail the use of a camera to remember a remarkable place when you're out exploring the world. 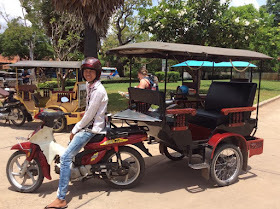 You can reach all of Siem Reap's temples and ruins by traveling on a bike (for DIY purposes), Tuk-Tuk or car. Most hotels in the city already offer guided tour packages with transportation at very affordable rates, so you might want to consider those. In our opinion, availing of a Tuk-Tuk service is a good option. They have well-cushioned and roomy seats (great for long travels) that can accommodate at least four people. You will find plenty of locals who will offer you their services. While many tourists explore on their own, visitors like us opted to avail of a guided tour. The lad who picked us up from the airport, who also happened to work for the hotel we stayed in, was also the one who drove us to the temples. Not only did he bring us to our destination safely. He also shared bits of information about the city that he truly loves and respects. Thank you so much! :) God bless you.